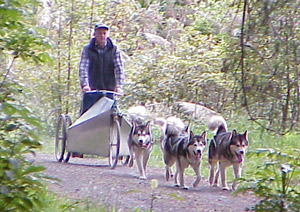 Until 1989 no malamutes competed in sled dog racing in New Zealand. 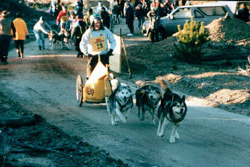 When the first malamute teams raced they were, by definition and actual fact, not competitive with the smaller faster Siberian huskies. Moves were started to have freight racing introduced, which were actually intended to create a class where malamutes competed against malamutes, and separated from the Siberians and crossbreeds. The first races held in the early 1990's saw a freight weight of 10kgs carried, regardless of team size. This, in reality, was less than the difference in actual weight of differing rigs. These weights were gradually increased, initially including the rig, until eventually the format we know today was agreed, where the actual freight, independent of rig and mandatory equipment weight, equating to 50lbs per dog, is carried. i.e. the lower end of the international freight racing scale of weights to be carried. until today teams of 4 dogs, carrying 91kgs are regularly competing. 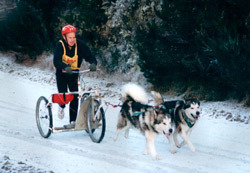 endurance ability of the Alaskan Malamute. Perhaps in the future we will see freight weights at international levels (between 50lbs per dog to 75lbs per dog, dependant of trail conditions) carried and this sport reach full maturity. This article was written by long time freighter Peter Stables.